Microsoft.AspNetCore.SpaTemplates plugs into dotnet new, providing project templates for Angular 2, Aurelia, Knockout, React, and React+Redux applications. Microsoft.AspNetCore.SpaServices is how SpaTemplates-produced projects work internally. It provides useful features for SPA applications, such as server-side rendering for Angular and React applications, plus integration with Webpack build middleware. Or, if you’re on Windows, you can install the latest Visual Studio 2017 RC, which includes it. Be sure you have VS2017 build 26206 or later – older versions won’t work. The easiest way to get started is by using one of the project templates we’ve made available. These plug into the standard dotnet new command, and work on Windows, Mac, and Linux. There are two ways to run your new project: via the command line, or via Visual Studio (Windows only). If you’re using PowerShell in Windows, execute $Env:ASPNETCORE_ENVIRONMENT = "Development"
Finally, you can start your new app by running dotnet run. It will listen on port 5000, so point your browser to http://localhost:5000 to see it. If you’re on Windows and want to use Visual Studio 2017 RC, you can simply open your newly-generated .csproj file in Visual Studio. It will take care of restoring the .NET and NPM dependencies for you (though it can take a few minutes). When your dependencies are restored, just press Ctrl+F5 to launch the application in a browser as usual. 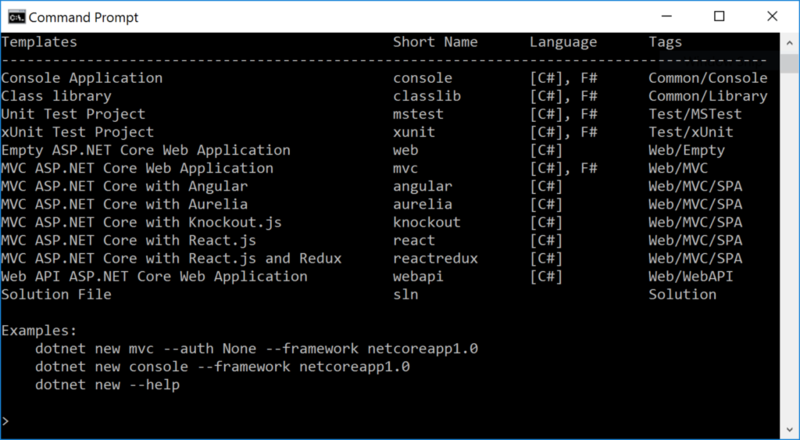 If for some reason you’re stuck on older (pre-RC4) versions of .NET Core tooling, or if you need to use Visual Studio 2015, then instead of using the dotnet new command, you can use Yeoman to create your new project. 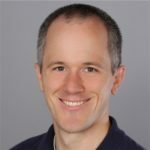 You’ll need .NET Core SDK 1.1 and Node.js version 6 or later. Once your new project is created, Yeoman will automatically fetch its .NET and NPM dependencies. You can then set the ASPNETCORE_ENVIRONMENT variable as described above, then run your project by executing dotnet run. Let’s now look at some of the features in the templates. The primary use case for server-side prerendering is to make your page appear extremely quickly, even if the user has a slow network connection or a slow mobile device, and even if your SPA codebase is very large. The client-side code will download in the background, and then takes over execution as soon as it’s loaded. This feature solves what is otherwise a significant drawback of large SPA frameworks. These projects all use Webpack as a front-end build system, because it’s the dominant system used by Angular/React/etc developers. One of its powerful features is the ability, during development, to keep running in the background and incrementally recompile any modified code extremely quickly. Hot Module Replacement (HMR) takes the dev middleware feature a step further. It sets up a live link between the Webpack dev middleware service and your application running in your local browser. Whenever your source files change and the dev middleware provides an incremental update, HMR pushes it to your local browser immediately. It does thiswithout causing a full page reload (because that might wipe out useful state, such as any debugging session you have in progress). It directly updates the affected modules in your running application. The purpose of this is to give you a faster, more productive development experience. To see it working, just edit one of the TypeScript or HTML files in your /ClientApp directory. You’ll see the corresponding update appear in your browser right away. If you’re using React or React+Redux, your application state will br preserved through the update. If you cause a compiler error, its details will appear as an overlay in your browser. Once you fix the compiler error, your application will resume, still preserving its previous in-memory state. Note: HMR is currently available in all the templates except for the Aurelia one. We aim to add it to the Aurelia template soon. Since this is achieved using Webpack 2, you can easily edit the Webpack configration files to set up whatever combination of build options you require, or to enable support for compiling LESS/SASS or other popular front-end file types and languages. See the webpack.config.js file at the root of the project, and Webpack 2 documentation for details of the available options. There’s a guide to enabling LESS support in the SpaServices documentation. The first line repackages all of your vendor dependencies, i.e., third party libraries such as Angular or React and all their dependencies. You only need to run this if you modify your third-party dependencies, such as if you update to a newer version of your chosen SPA framework. The second line (running webpack with no parameters) rebuilds your own application code. Separating your own application code from your vendor dependencies makes your builds much faster. These commands will produce development-mode builds. If you want to produce production-mode builds, then also pass the flag --env.prod when invoking Webpack. This will produce a ready-to-deploy production build of your application. 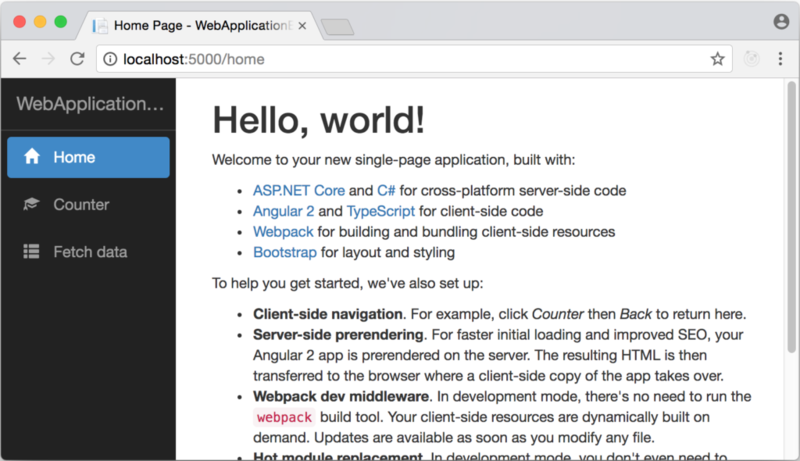 It includes .NET code compiled in Release mode, and invokes Webpack with the --env.prod flag to produce a production build of front-end assets. Equivalently, you can use the Publish option from Visual Studio’s Build menu. Learn more about SpaServices and see other usage examples at the SpaServices online documentation. 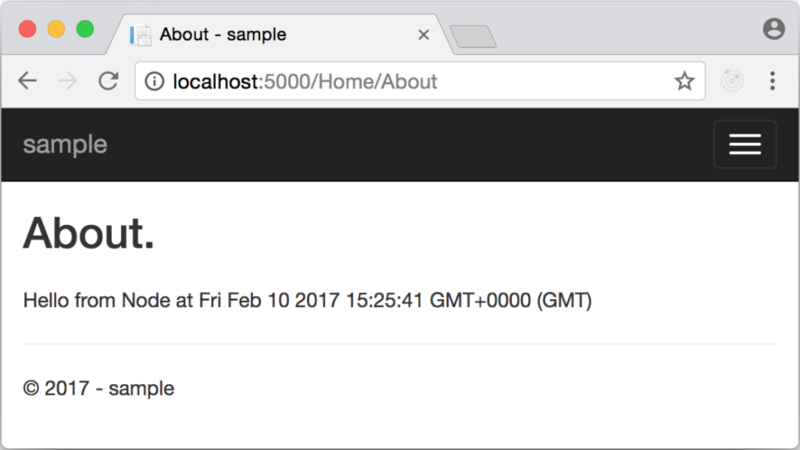 For this walkthrough, first create a new application with ASP.NET Core 1.1.0 or later. Imagine you want to display some charts and graphs in your web pages. These need to be constructed dynamically using data from some backend database or web service. There are various ways to approach this. One popular choice today is to have the server send raw data values to the browser, and then use a client-side library to actually draw the charts. For example, you could use the extremely popular chartist.js library. The options and data objects, when JSON-serialized, will be in exactly the correct format for Chartist. You can learn more about the available chart types and option in Chartist’s documentation. In your About.cshtml, replace @ViewData["ResultFromNode"] with @Html.Raw(ViewData["ChartMarkup"]). You need to use Html.Raw because Chartist will return SVG markup. This looks identical to how Chartist would render the same data on the client, except now it involves no client-side code for the browser to execute. Chartist is relatively simple. If it turns out that your requirements are too sophisticated for it, you could switch to the incredibly powerful D3.js, because that also supports running in Node and therefore works with NodeServices. Of course, rendering charts is just one example. NodeServices allows ASP.NET Core developers to make use of the entire NPM ecosystem, which gives rise to a huge range of possibilities. You can read more about the APIs in NodeServices (for invoking Node.js code from .NET) at the NodeServices project on GitHub. Similarly, you can read more about the APIs in SpaServices (a package of SPA-specific helpers, e.g., for server-side prerendering) at the SpaServicesProject on GitHub.